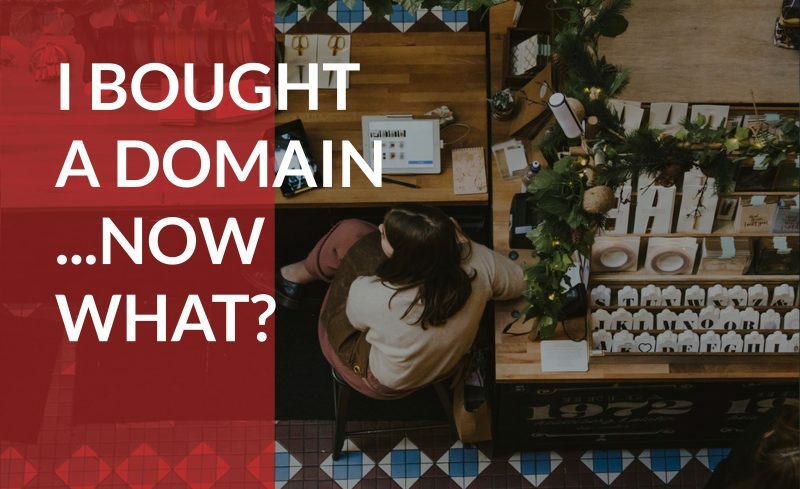 You are here:Home-Domain.com-I Bought a Domain Name, Now What? I Bought a Domain Name, Now What? You’ve done the research, selected a perfect domain name for your business, completed the registration process, and now each WhoIs search on your domain reveals you as the rightful owner. Once you’ve secured your new domain, it’s time for the real work to begin. You can start by building your business a website, filling that website with valuable content, and developing a marketing strategy to draw people to your brand. Learn how to get started below. Your domain name secures an address for your business, but it’s up to you to build a home for customers to find you. Most businesses, even if they have a retail store with consistent foot traffic, decide to build a website to expand their reach beyond their backyard and start selling products around the world through the internet. If your only goal with a website is to promote your brick and mortar business, even a simple landing page can help spread your name and create a feedback loop to push people to your front door. Creating a full website, however, quickly becomes an asset for drawing people in to keep them purchasing from your business. You could hire a web designer to do it for you, but you could also build it yourself with a drag and drop website builder. The benefits of a full website are vast, but one of the major benefits is that you can create a stockpile of valuable content that keeps people coming back to your site again and again. No matter your industry, you can use your knowledge to create content that helps customers and also points them to your products or services. The primary goal of your content should be to help solve the problems of your customers as they relate to your products and services. Once customers see that you’re intentions are good, they are more likely to buy from your business. If you own a landscaping company, for example, you can use content to help people maintain their yard between appointments, or outline creative yard designs. When they see how much is involved in a project, and see you as the expert, there’s a good chance they’ll hire you to realize the design. Getting started is not as difficult as it may sound. Once you’ve created valuable content that helps your customers, start building an email list and sending updates about your business or recaps of content published on your blog. Use social media to promote new blog posts, and to start discussions with your customers to find out what problems they’re having. Then you can target new audiences similar to your current customers using Google Adwords or a similar advertising tool. You don’t need to hire a full-time marketer to successfully market your business, especially when you’re just starting out. Even spending just 15-30 minutes a day in between customers can add up to a significant marketing push. The key is to outline your goals, establish must-have items to complete each week and tackle them one by one until you’re finished. Start with the goal of one marketing task every week. The first week can include brainstorming and writing a blog post. The next week, create and send an email to promote that new piece of content once it’s been perfected and published on your blog. Then, start a discussion with your customers on your social media channels the next week and use their responses to create content for online ads to run during the final week of the month. After doing the research to select the perfect domain name for your business and finalizing the registration process you can start attracting new customers with the right plan. Start by creating a website, then fill your new website with valuable content that fuels a marketing strategy bringing people back to your business. Your new domain name will soon boost your success out of your backyard and into the world of the internet.